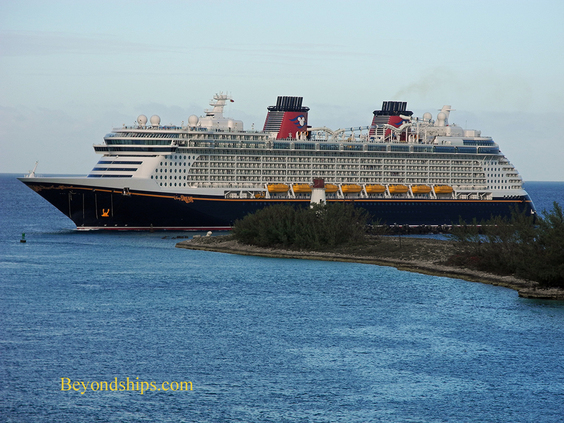 Above: Disney Dream entering Nassau harbor. Above: The harbor control tower looms over the port. 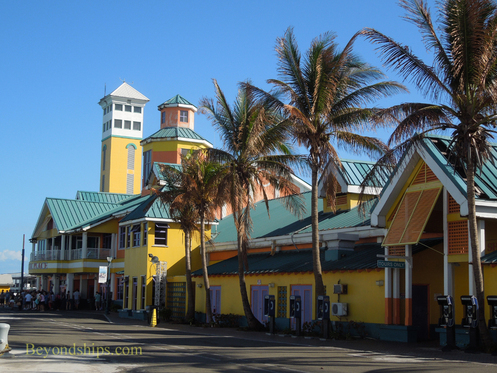 Above and below: The Festival Place Welcome Center is the cruise terminal building in Nassau. 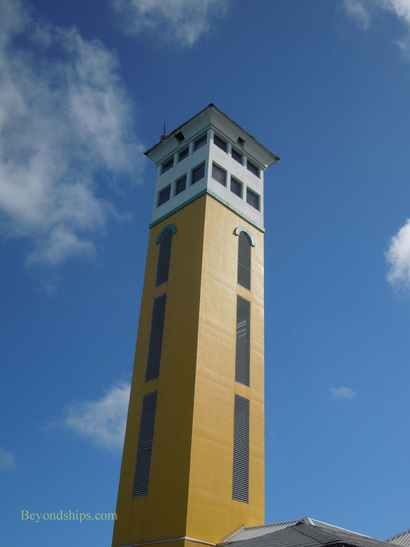 Nassau is one of the busiest cruise ship ports of call in the world. 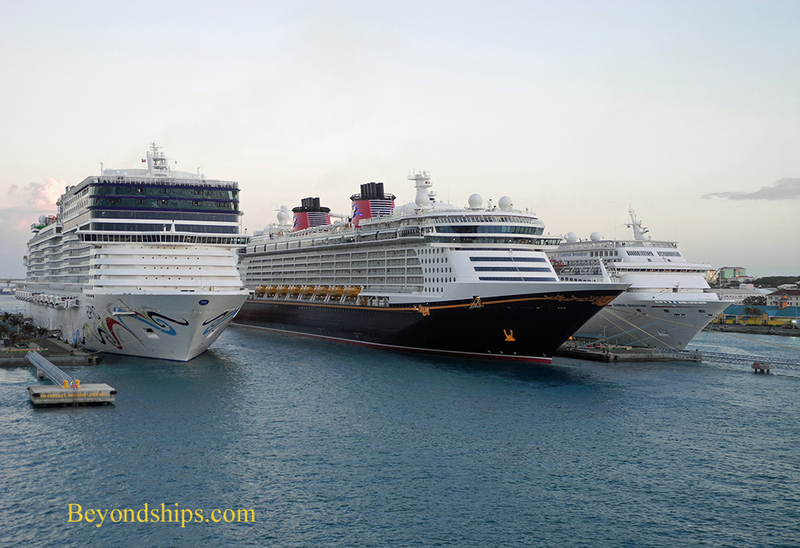 Some three million cruise ship passengers pass through the port each year. The harbor is essentially a rectangle that lies between Paradise Island on the seaward side and the town's business district. Ships enter the harbor through a passage on the northwest side near the Paradise Island lighthouse. They then turn to port, proceed through a turning area and dock. 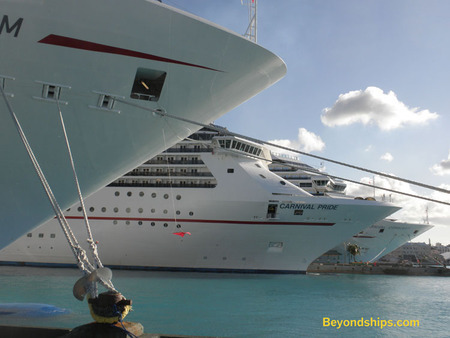 The docks can handle seven large cruise ships at a time. The cruise ship port is called Prince George Wharf. 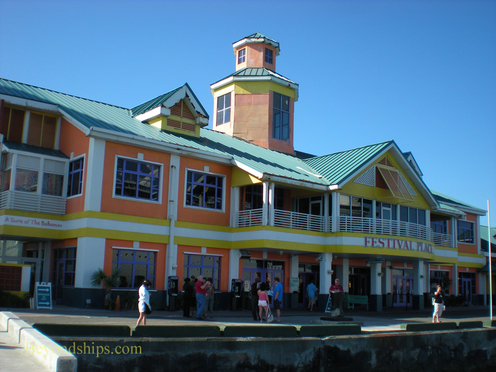 In addition to the piers, the complex includes the Festival Place Welcome Center. In order to enter or exit the complex, you have to go through the Welcome Center. Inside the Welcome Center is an information desk and various stalls selling local crafts and souvenir items. Outside on the other side of the Welcome Center is a parking area where you can find taxis, tour operators and horse drawn carriages. 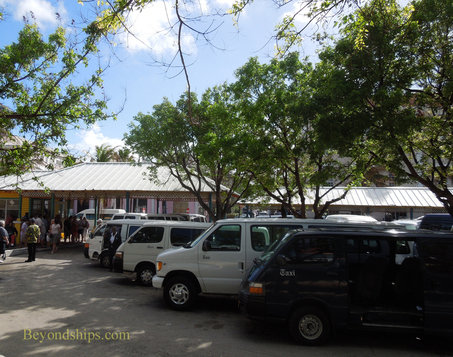 This is also where the vehicles used for shore excursions await. 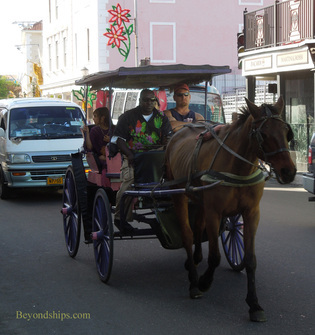 If you are just intending to see the sights of downtown Nassau or shop on Bay Street, they are within walking distance of the Welcome Center. Indeed, they are essentially right out the door as you exit. Above: Norwegian Epic, Disney Dream and Carnival Sensation in Nassau. On the other side of the Welcome Center there are taxis and other types of transportation.